This page was created by Brittney Smith, a senior English major at UCSB (link to author page). I became interested in Eva as soon as I learned of her direct connection with Adolf Hitler. Her story is short and tragic, but very interesting. She was as close to Hitler as one could be, yet kept so far away at the same time. My information came from various Internet sources (sources). The infamous name of Eva Braun is one that resonates with some, but has been forgotten by most. This is not truthfully surprising since for most of her adult life she was kept as a fragile toy in Adolf Hitler's Austrian Alps hideaway, rarely seen or heard of in public. Most did not even know that she and Hitler were romantically involved until much closer to the end of their lives since Hitler chose to keep their relationship secret. Having met for the first time in 1929, when Eva was just 17, she and Hitler would continue their affair for over 15 years. 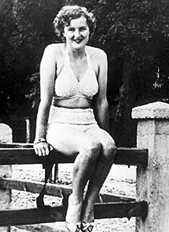 Not much is known about Eva Braun. This is due primarily to the fact that her life was fairly uneventful even though she was so close to Hitler and in association with many top Nazi officials. Each time important political guests came to visit, Hitler banished Eva to her room. He was heard to say "that a highly intelligent man should always choose a primitive and stupid woman," and this said in front of Eva! ( www.auschwitz.dk/Braun.htm ) Still, Eva was very much in love with Hitler, whom she playfully referred to as "Wulf," and after he had survived a near death experience in 1944, she wrote him a love letter stating that "'from our first meeting I swore to follow you anywhere - even unto death - I live only for your love'" ( www.auschwitz.dk/Braun.htm ). This was not the first time, nor the last, that Eva would be driven to speak of suicide when concerned about Hitler. In 1932 she tried to shoot herself and then three years later she took an overdose of sleeping pills ( www.fpp.co.uk/Hitler/docs/EvaBraun2.html ). Hitler's affection for Eva may not have been as dramatic and public as hers was of him, but he did love her in his own way, evident by his first will on May 2, 1938 . Here he put Eva "at the top of his personal bequests - in the event of his death she was to receive the equivalent of 600 [British pounds] a year for the rest of her life" ( www.us-israel.org/jsource/Holocaust/braun.html ). He kept her well, but he treated her only as he felt women ought to be treated as inferior to men. This deep devotion that Eva had for Hitler would lead her to an early death; one that Hitler tried to spare her of though she refused to leave his side. On April 30, 1945 , a few short hours after their hurried marriage, Eva and Hitler took vials of poison (cyanide) in order to commit suicide and avoid a worse than death experience at the hands of their enemies. While Eva found the poison a sufficient means to end her life, Hitler had himself shot in the head in addition to hurry the process along. Those who entered his suite later found them before the Allied troops arrived and were subsequently doused in gasoline and burned. However, their bodies were found before the cremation had successfully finished and the Soviet troops took the bodies with them as they moved out of Berlin . The bodies were carried by day and buried each night wherever the troops camped. Each morning, the corpses of Eva Braun and Adolf Hitler would be re-dug up and carried onward until they reached Magdeburg where they were buried for 25 years. In 1970, however, the bodies were uncovered once again and finally destroyed. It is a gruesome ending to what might have been a standard love story, but oh, let us not forget whom we are speaking of! Eva's constant comment to her friends defending Hitler's actions sums up her feelings and her character more thoroughly than anyone could ever describe: "Better that ten thousand others die than he be lost to Germany " ( www.us-israel.org/jsource/Holocaust/braun.html ). How little she knew; how blinded by love she was - what a perfect woman for Hitler.